The word "society" suits these little birds to a tee, as they are very social and like to get into everybody's business! Society Finches make great pets for the beginner. They are one of the easiest birds to care for, very hardy, inexpensive, and are prolific breeders. Society Finches are one of the most charming and interesting of all the small Mannikins! They are believed to have been developed in Asia over three hundred years ago by Chinese and Japanese breeders. It is assumed they are a domestic form of the White-backed Munia (Lonchura striata) though their absolute ancestry is uncertain. Ninja singing . The other bengalese, Sushi is seen inside the cage, having some millet. Description: Society Finches reach a size of 4 1/4" to 4 3/4" (11-12 cm). They have three basic color varieties: chocolate and white, fawn and white, and pure white. Tri-coloreds, crested forms (developed in the 1930's), and solid colors are also seen. No two Society Finches are alike! Distribution: Society Finches are totally domestic and large numbers are bred in captivity. Care and Feeding: Fresh food and water must be provided daily. A good finch seed mix will provide their everyday preference for millets and canary seed and is readily available at a pet store. In a separate cup supply green foods regularly, such as chickweed and spinach. Other supplements include egg foods, apple and pear. Finch treats of seed with honey, fruits and vegetables are fun for your bird too, as well as nutritious! Offer your finch a bath occasionally by providing a bath dish that is 1" deep with a 1/2" of water, or a clip on bath house. Their nails may occasionally need to be trimmed, but be careful never to clip into the vein as the bird can quickly bleed to death. Bird nail trimmers and styptic powder to stop the bleeding are available at pet shops. Housing: Society Finches do well indoors in a cage. Place the cage where it is well ventilated though free from drafts, and against a wall at eye level. It should have good light but be away from doors and windows where direct exposure to sunlight can make it overly warm. Provide two or three good softwood perches about 3/8" to 3/4" in diameter. Tree branches of a similar size also make good perches and will help to wear the claws down naturally. Provide separate dishes for food, water, treats, and grit. Place paper on the cage bottom that can be sprinkled with grit, or use a grit paper. Society Finches also do very well an in aviaries or bird rooms. The screening should be 3/8" square mesh. Dishes for food, water, grit and bathing water must be included along with perches and nests. Plants that are not poisonous, such as fruit trees, privet, forsythia, and honeysuckle bushes will make the space more enjoyable for the finches. Maintenance: Although finches require very little time, a clean environment as well as fresh food and water daily is a must to prevent disease and illness. The basic cage care includes daily cleaning of the water and food dishes. Every two to three days change the paper on the bottom of the cage and sprinkle it with about 1/8" of fresh grit. Weekly wash and dry the entire cage, including the perches. Social Behaviors: Society Finches are very, very social and should be kept in groups (except when breeding a single pair). They are most friendly, have an ideal temperament, and are never aggressive toward other birds. Handling/Training: Finches are simply enjoyed for their antics and play rather than training. When you need to handle your finch to examine it or clip it's nails, place your palm on it's back and wrap your fingers around the bird with your thumb and forefinger on either side of it's head. Activities: Society Finches are active and very friendly. They are so social and such busy bodies that they can often get in the way of, and disrupt the breeding habits of other more private birds! Keep an eye on your energetic friends in an aviary! Breeding/Reproduction: Society Finches are one of the most reliable breeders! They can be bred as individual pairs housed separately or as groups in aviaries. When breeding in groups, you must make sure you have more than three pairs to prevent a pecking order. One drawback to aviary breeding is over eagerness. They will often all crowd into one nest to lay and incubate their eggs. They get in each others way and make it impossible for any one hen to incubate the eggs. They are such dedicated breeders, they will even incubate and rear the young of many other birds. &nbsp The sexes are very similar, but the male will display mating behavior by singing a little song to the female. Females are generally quiet unless visually separated from their mate. In this case, the male will call to the female with a single syllable, while the hen's answer will be three or four syllables. They like a closed or partially open nest. The size of a nest box should be about 5" or 6" (13 -16 cm). Nesting materials such as grasses and hay will be appreciated, and they will line the nest with feathers and soft materials. The female will lay a clutch of 4 to 6 eggs. The female will do most of the sitting on the eggs and they will hatch in 12 to 13 days. Both parents will feed the hatchlings. At this time provide lots of greens, seed and egg food. Potential Problems: Society Finches are very hardy birds and almost all illnesses can be traced to improper diet, dirty cages, and drafts. A balanced diet and plenty of exercise will prevent most illnesses. 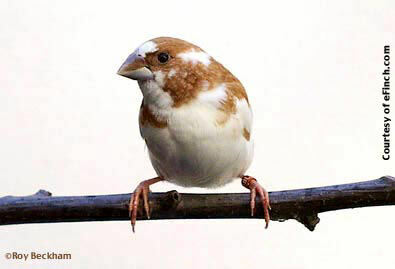 The white coloration of Society Finches can often be albino, with pink eyes, and prone to eye problems. Eye problems of this sort can be prevented by supplying lots of green foods high in carotene. Know your birds and watch for real drastic changes as indications of illness. First you can try and isolate the bird in a hospital cage where you cover all but the front of the cage and add a light bulb or heating pad to keep the interior of the cage at a constant temperature of 85 degrees Fahrenheit. Remove all perches and put food and water dishes on the floor. If you don't see improvements within a few hours, take the bird to an avian veterinarian for diagnosis and treatment. Availability: Society Finches are readily available in the pet industry in the three basic colorations. With a little more determination, you should be able to find the tri-colors, crested and solid colors as well. Because they are bred so easily in captivity, they are very inexpensive little birds. Hi, I have a society finches born with red eyes, is that normal? So I’ve purchased 2 society’s right after Boxing Day, soo after I had eggs, 4 of them....then I had 4 babies....I lost one baby (was sooo sad, came home from work and it was hanging outta the nest 😭😭) so I now have 2 parents, and 3 babies...I purchased a large flight cage for them. I’ve read they will all be okay in the cage together as a family...but I’ve also read that there is something called...odd bird out syndrome, because of the odd numbers....do I go buy a new one? To make the numbers even?? Thoughts?? I am so sorry you lost a baby! I can imagine how hard that must of been. Since the birds are a family they are probably fine in a cage in odd numbers. Odd bird out syndrome is more with breeding pairs when there is too many males over females etc. You should be fine without another bird and might be better without another one. I hope this helps. Trying to find a breeder of Societies, I live in Houston, TX and have been unable to find one. I know they have birds at Petco/Petsmart. But they have several in the same enclosure. I feel like I would have to buy all of them in order not to break up the family. Any suggestions?